This entry was posted in Downtown, Environment, Transportation and tagged Parker Harding Plaza. Bookmark the permalink. 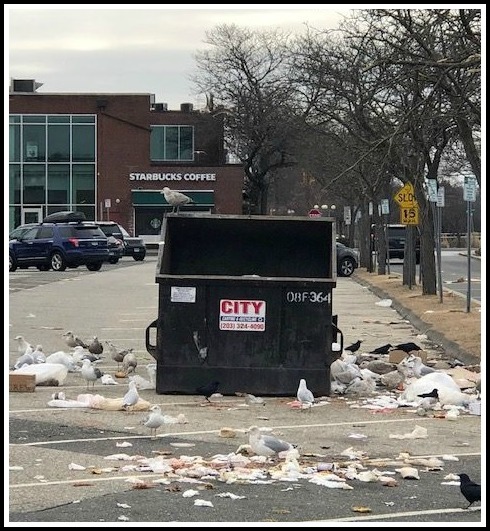 The mess made the seagulls happy, at least. Everyone should mail this picture to Jim Marpe. This has been like this since before Christmas. Really shameful. On the other hand, take a look at the Brick Walk parking lot in Fairfield. I was going to write you today about this so not surprised to see your posting. What gives? It’s just as awful as the one over by Starbucks used to be. Even worse if you figure it’s taking up several parking places. Who does it belong to? How can we get rid of it? Folks, we just saw this and we will visit this location tomorrow to clean up. We will also recommend to the customer that they order a larger container to hopefully reduce/eliminate overloading and spillage in the future. I wonder how the people who parked this dumpster park their cars!? When my husband was alive he would have been on this ASAP!! We really do need to look at Fairfield Center and find out what makes their town work! Just saying!! Fairfield center, especially in the summer, is thriving and a fun place to go to and spend an evening! On the other hand, at 9:30 pm, downtown Westport is as boring watching grass grow in Phoenix! Perennial ryegrass or tall fescue? If you were watching in Phoenix, most likely a Bermuda grass or Midiron…also, a mixture of manure and compost is recommended for a better grass growing viewing. Of course, Westport would be more likely a Bluegrass, Rye and Fescue mix….and if you use a high nitrogen fertilizer ( perhaps manure), again, you would improve the rate of growth and thus the viewing. So there you have it…more manure to improve the downtown grass watching experience. When independent shopkeepers actually owned and worked there like your husband did and the current ownership of Rye Ridge formerly Oscars they gave a damn. These chains don’t and the staff takes the position that it not my job to do anything about it much less care. It’s a shame. James Walsh you are so right! They just do not give a damn, they think it is not their job! I recall hearing that the fancy new compacter in Parker Harding which was to replace the dumpsters instantly fell victim to an undiagnosed electrical/mechanical fault. I’m not sure, of course, but I suspect that siting said compactor in a flood zone may have contributed to its present status. The compactor issue did run into some snags as Morley pointed out. I have followed and supported most of the hard work of the Downtown Plan Implementation Committee and hope that either that Committee, through its Chair and/or Jim Marpe will address what happened here. Yes, the new compactors have indeed run into some snags. The transition has not been as seamless as we hoped. We were made aware of this current situation and immediately dispatched a representative from our team (joined by our president) to clean up the mess by hand. The WDMA, the Town and the DPIC are all working to fix the situation as quickly as possible, and to avoid future issues. We are required to strike a balance between ensuring our merchants can properly rid their space of trash, while taking up the minimal amount of parking, and keeping the receptacles as unobtrusive as possible. It’s an ongoing process. Once the compactors are running properly and the new enclosure is built, we are confident the results will be positive. In addition, we have made a call to our merchants to assist us in our efforts by disposing of their trash more responsibly, and contacting us earlier if there is an issue, before it gets out of hand. Colleen, what is the source of the problem and approximately when was it discovered? I have an idea. Might the greedy landlords in their wisdom lower their rent or leasing costs to invite local businesses to the downtown area. I know it’s a stretch but wth. This mess is probably because animals, gulls during the day and raccoons at night, get into the open container and take edibles out. Rats probably come to scavenge, too. It is disgusting and a public health menace. Why isn’t the Downtown Merchants Association doing something?